What’s a baby to do when traditional sugar and spice just doesn’t make the grade? Go Black! 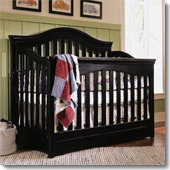 Boldly decorate the nursery with a black crib. A black crib exudes confidence. A black baby crib delivers a sophistication not easily found in baby furniture.